Short term pain for long term gain; post-election euphoria. Malaysia’s economy expanded by 5.4 per cent year-on-year (y-o-y) in Q1 2018 (Q4 2017: 5.9 per cent y-o-y). Unemployment rate decreased marginally to 3.3 per cent in Q1 2018. Headline inflation, measured by the annual change in Consumer Price Index (CPI), trended lower at 1.8 per cent in Q1 2018 (Q4 2017: 3.5 per cent). Consumer Sentiment Index (CSI) rose higher to 91.0 in Q1 2018 from 82.6 in Q4 2017. In Q2, the Ringgit depreciated by 3.0 per cent, to RM3.98 per US dollar. 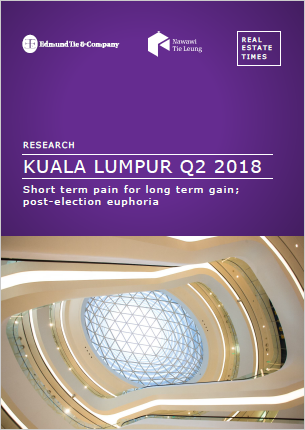 Despite a heated GE14, investment sales rose q-o-q in Q2. The investment market was largely led by hotel property deals. Inevitable short-term pains of fiscal consolidation and project cutbacks given the high public debt, will be felt across businesses. General optimism prevails with expectations that new economic policies and greater transparency will lay the foundation for better and sustainable economic growth. There were no new completions in Q2 as the bulk of new completions for 2018 are expected in H2 2018. Capital value and average monthly rental rates remained at RM875 psf and RM5.98 psf respectively (Figure 5). Average occupancy rates remained flat at 80.0 per cent with no major upside in demand as businesses continue to be cautious with emerging external risks such as a trade war (Figure 6). Retail sales recorded a modest growth of 2.6 per cent for Q1 2018. Total retail stock in KL rose to 31.1m sq ft with the opening of Shoppes at the Four Season Place in May. Meanwhile, stock outside KL remained at 31m sq ft (Figure 8). Retail mall occupancy in KL lingered at 86.0 per cent. Two developments were completed in Q2 2018, bringing a substantial new supply of 1,168 condominium units into the market. The two developments are The Fennel in Sentul East (916 units) and Dorsett Residences in Bukit Bintang (252 units). Some 5,260 high-end residential units are expected to complete in H2 2018, of which 40 per cent will be in the city centre (Figure 9). The price of high-end condominiums increased by 4.4 per cent q-o-q to RM784 psf (Figure 10). On the other hand, rent eased by 6.3 per cent q-o-q to RM2.77 psf in a competitive market lacking tenant demand.